There are a easy ways to figure out how to use lighting effectively in your bedroom. You have a couple of different choices – overhead lights, table lights and floor lamps. Each piece can offer a different lighting option to tie together any bedroom décor. Overhead lights: these are the most common standard bedroom fixtures. You can go as elaborate as your budget desires. A good option is to choose multi bulb fixtures. Using multi bulb fixtures offers two benefits. First off when a bulb burns out you aren’t left sitting in the dark until you get a chance to replace it. Second they let you shed more light on the entire room. For added ambience install a dimmer switch on the lights. Table lights: Table lights work great on a nightstand. If you like to read in bed at night you will need a lamp with an adjustable neck. Once you have the table lamp you need a bulb for it. For reading try going with a bulb that has a more natural light similar to sunlight. It’s a bit more costly but will be much easier on your eyes. 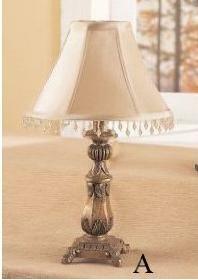 Floor lamps: Floor lamps can help shed light into dark corners of any room. For subdued lighting use a lamp that has an upward facing shade. This will allow light to spill out indirectly and eliminate any glare. The other option is to go with a directed beam floor lamp that you can use to accentuate a piece of art or even provide extra lighting for a dressing table. Overhead, table and floor lamps are your three basic choices when choosing how to effectively light your bedroom. They’re available in any shape style and design to fit your own personal tastes. Choosing the right lighting combination will bring extra warmth and beauty into the bedroom suite.